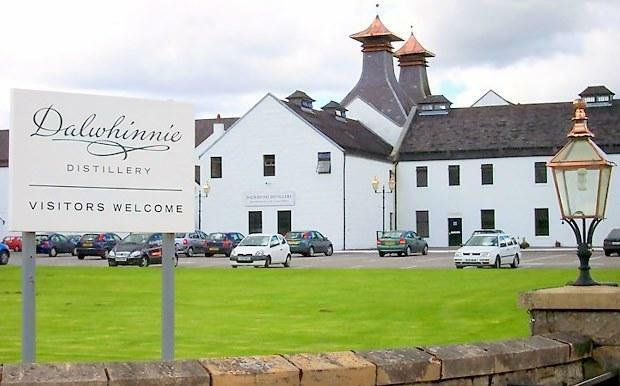 Dalwhinnie Distillery, in the Highland village of Dalwhinnie in Scotland, produces Single malt Scotch whisky classified among the Highland Single Malts. In 1897, John Grant, George Sellar and Alexander Mackenzie founded the Strathspey distillery. Production started in 1898 but unfortunately the partnership was bankrupt the same year.. The site was chosen for its access to clear spring water from Lochan-Doire-Uaine and abundant peat from the surrounding bogs. Set in splendid mountain scenery, Dalwhinnie is the one of the highest distilleries in Scotland at 1164' above sea level. The name Dalwhinnie is derived from Gaelic word Dail-coinneeamh, which means meeting place, referring to the meeting of ancient cattle drovers' routes through the mountains. "Dry fruits. A hint of peat. Sweet and sour. Great single malt from the highlands"
"The Distillers Edition was finished in sherry casks, resulting in an engaging sipping experience. Oloroso Sherry characteristics shade Dalwhinnie's peat, heather and honey characteristics. The finish is still quite dry and spicy, but with an added grape element."